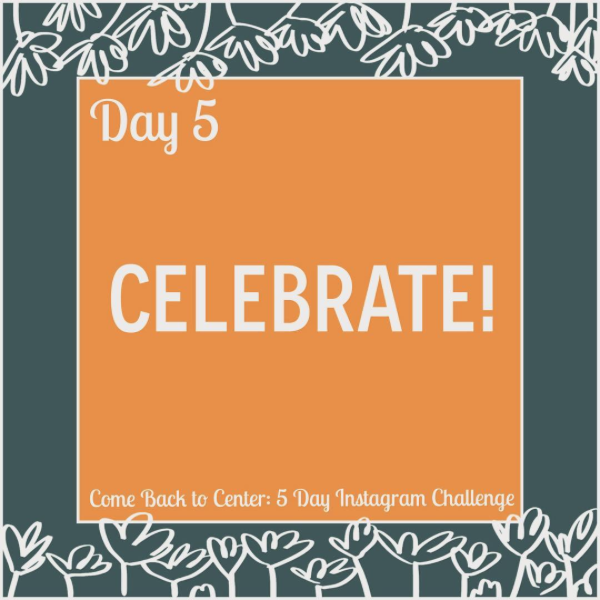 This is the fifth and final day of our 5 Day Instagram Challenge! If you haven’t already, you can join the challenge by following us on Instagram or by joining the Sweet Water Sisterhood Facebook group. Today your challenge is to CELEBRATE! Celebrating reminds us of all that we have to be grateful for. It shifts our brains into a mode of appreciation instead of critically assessing what is wrong with our lives or what we need to work on. Before you decide what to celebrate and how to celebrate it, I want you to take a few minutes to make a list of things you are thankful for. Set a timer for five minutes and see how many things you can write down. Once you have taken the time to be thankful, then start thinking of what you could celebrate today and an activity that would add to the joy of what you are thankful for. A half-birthday or small life anniversary (like the anniversary of when you painted your room a new color or when you planted your first garden or when you moved into your home). Look through your calendar and see what you could find – it could even be a 1 month or 1 week anniversary of something! Small victories – getting through a busy week or a making a deadline, a child sleeping through the night in his own bed, a month without being sick, completing this week’s challenges – anything that feels like a success to you! The good things in life: your family, a dear friend, your home, your job that you love, sunny weather, flowers blooming, the weekend, etc. There are lots of things to celebrate when we take the time to notice them. I’d love to hear what you come up with! Do something you love to do, like going to a beautiful outdoor location, wearing your favorite outfit, or listening to music that makes you smile. Eat foods that feel like a treat but that you won’t feel guilty about – fresh fruit you don’t usually buy, a homemade dessert, dinner at your favorite restaurant, chocolate, tea – something that feels a bit extravagant and celebratory! Express yourself! Sing, dance, talk about what you are celebrating with other people or celebrate with friends/family. Add a little beauty. Buy or pick some flowers to put on the table, pull out your nice plates for dinner, or add some simple decorations to your celebration. Keep it simple. Don’t stress yourself out trying to do something special. Sometimes the simplest things can feel the most nourishing to our hearts. This way, it feels like a treat and not like a chore. Celebrations are part of every culture. They help us step out of the grind of everyday life, notice the goodness around us, and receive at a deeper levels the gifts God has for us. Don’t miss this chance to celebrate! And, I’d love to hear about it once you’ve done it – post a photo or comment below about how you are celebrating today.